Geometric shapes, lines and textures create the border for the insert of your choice on this stunning medal. The ring at the top makes it easy to attach a ribbon, and the back can be personalized for your event. This medal is a modern twist on a very traditional award for excellence. A sparkling diamond design surrounds the insert area of this lovely medal that is available in gold, silver or bronze. Choose a 2" insert from a wide variety to fit your occasion, clip a ribbon to the ring at the top, and personalize the back of the medal. You have just created a budget friendly award that is sure to be cherished. Two soccer players battle it out for the goal on this budget friendly trophy. They sit atop a star column riser mounted to a black weighted base that has room to personalize for your event. Recognize your team's success on the soccer field with an award they'll be proud to receive. A full color soccer ball framed by gold stippled falcon wings and mounted to a black marble base creates this award. Personalize the base for your event and you have a modern looking trophy that will fit any budget. 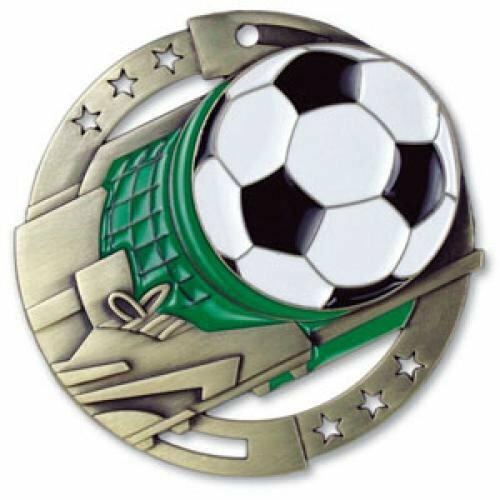 This modern resin design features a silver victory "V" embellished with gold stars and stripes that supports a full color soccer ball. Standing on a black base that has plenty of room to personalize for your event, this budget friendly award is a great way to recognize prowess on the soccer field! Standing at the top of this trophy is a female soccer player ready to kick the game winning goal. The blazing blue column offers a splash of color, and the hourglass riser adds height and a finished look. 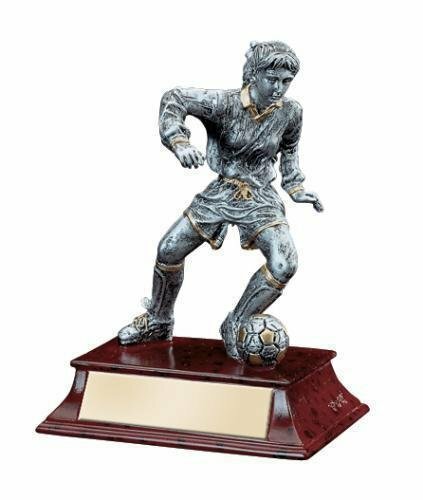 Mounted to a genuine marble base that can be personalized for your event, this classic trophy design is a proven winner.